We Design and Manufacture Industrial Hydraulic Shock Absorbers. With adjustable, standard, and heavy duty styles, we provide uniform resisting or stopping force to gradually slow your heavy loads without a bounce. We offer service and replacement for HANNA shock absorbers since acquiring the product line in 1976. As it brings a moving load to a stop, the EGD shock absorber converts kinetic energy into heat which dissipates into the surroundings. When a moving load strikes the bumper, it sets the piston in motion. The moving piston pushes oil through a series of holes from an inner, high pressure chamber to an outer, low pressure chamber. 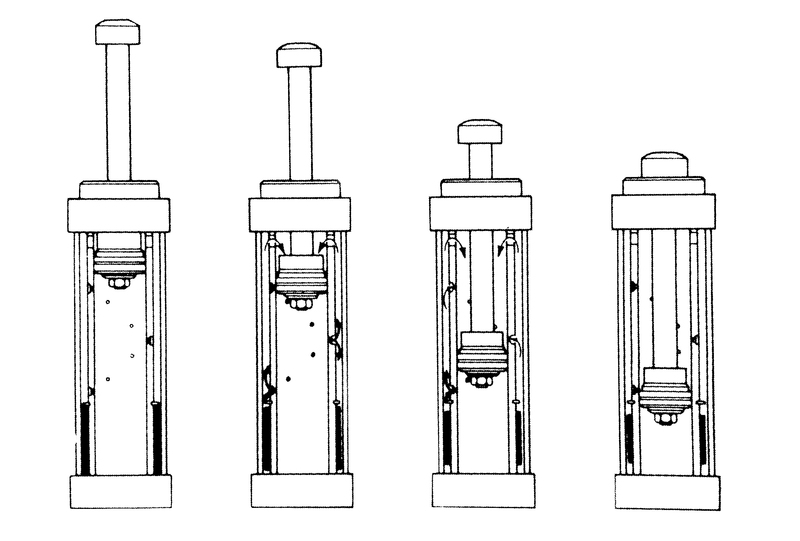 The pressure, created by the oil as it passes through the holes, acts against the piston to counteract the moving load. At the end of stroke the load comes to a gentle rest and the pressure drops to zero. The result is a uniform deceleration and a gentle stop with no bounce back. Since our shock absorbers are filled completely with oil, they can be mounted at any position or angle. The spring return units are entirely self-contained and extremely compact. Additionally, the multiple cavities used to regulate the flow of oil may be fixed or adjustable, giving you a wide range of possibilities. Check out our extensive catalog and parts lists/care instruction documents. There is no single type of shock absorber that is best for every situation, but with a few simple calculations, you can find a unit that is best suited for your application. Don't hesitate to contact us. One of our engineers will be happy to help you size the best shock for your situation. To learn more before calling, please fill out the application check list form found on the Catalog and Parts List page. Copyright 2017 EGD Mfg., Inc.